Project management is so important to ensure the smooth installation of your new storage system and we provide our own in-house project management team who will look after every aspect. Whether it’s a new build or an existing facility, our project managers carefully plan and manage the installation, so the system is fitted quickly and efficiently, helping to minimise the impact to your ongoing operations. We regularly work alongside builders, interior designers, architects and consultants, making sure our work fits seamlessly with other trades to ensure your project runs smoothly with no hold ups. “From design to implementation”:- Safety is always our priority, most of the projects we undertake fall within the remit of the Construction and Design Management Regulations 2015. These regulations place very specific responsibilities on Clients, Designers, contractors and subcontractors to ensure all work is carried out safely and that all structures and products are “fit for purpose”. Our staff are trained, certificated and competent to ensure we interpret the regulations correctly and manage our projects safely. 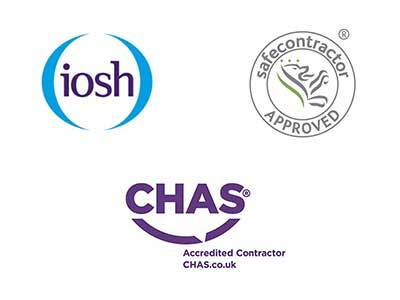 We have CHAS accreditation and our individual managers hold IOSH, CSCS and or SSSTS qualifications and accreditations.